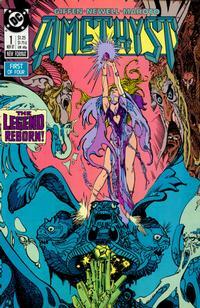 I have mixed feelings about the four issue mini-series that came out in the late 80s. While I was happy to see Amethyst again, her character changed dramatically. I thought the contrast of Amy Winston with her older incarnation as Amethyst made the earlier series charming. In this mini-series, Amethyst is a remote goddess, with little trace of Amy left. The art in the series is very pretty, although less innovative than the look that Ernie Colon established for the series. 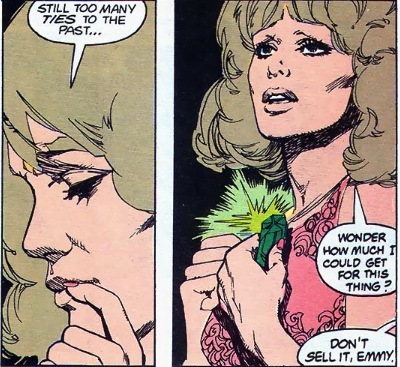 This mini-series firmly ties Amethyst to existing DC continuity, specifically the Legion of Super-Heroes. The cover of the issue proclaims “The Legend Reborn.” Amethyst stands in a forest surrounded by magical creatures. She holds her gemstone over her head, and it radiates purple light. As the issue opens an old man prepares to face his day. It is White Opal! He gets out of his hermit’s hut, preparing for his job. 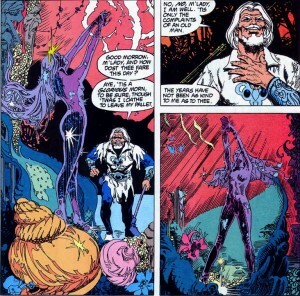 He greets a translucent statue of Amethyst, asking how she’s doing this morning. He says that the years haven’t been kind to him. A hare runs across the clearing, pursued by two hunters. One of the hunters is a young blond nobleman named Donal. He’s immediately struck with the beauty of the statue. His companion cautions him against foul magic, asking if enchantment is causing him to lust after a maiden made of glass. Donal says that he’s just seeing a gift for his father, Lord Topaz. White Opal is surprised that Donal is ignorant of the lost house of Amethyst. 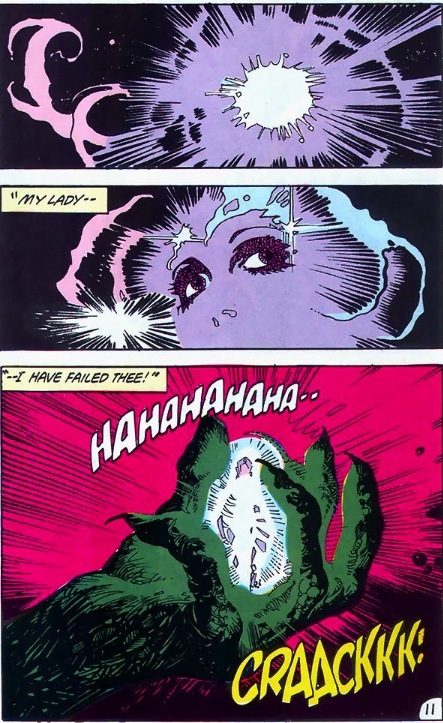 Opal talks about Amethyst as he knew her, not just the legend that has developed on the Gemworld in the past twenty years. 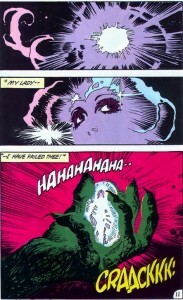 Elsewhere the Child and the Lords of Chaos are enraged as Amethyst’s name is evoked. The Child peaks in on the twelve houses of Gemworld nobility. The Child turns his hand into a giant lizard-like claw in order to strike at the Amethyst statue. The giant claw envelopes the statue. Donal is surprised and demands, “Who are thee old man, and what is the truth behind her?” White Opal yells “I have failed!!! My lady….” Somewhere a pair of purple eyes opens. The hand of chaos cracks the statue, releasing a beautiful woman. On Earth, Emmy wakes up yelling “Amy!” her husband asks if she had that dream again. Emmy tells him that she’s not one of his patients and he shouldn’t try to psychoanalyze her. She heads for the medicine cabinet to get some pills. A familiar looking lizard-creature is reflected in the bathroom mirror. Emmy wonders if she should sell her emerald pendant. Her husband tells her not to because when they first met he told her that it matched her eyes and asked if she was wearing colored contacts. Emmy asks if she’s becoming like her mother, and her husband tells her that she’s as normal as apple pie. They go back to bed. In the realm of Topaz, Lord Topaz and Lady Turquoise are worrying about their children. Donal seems fine, but his twin brother Wrynn seems troubled. Wrynn lurks in a dark basement of the castle, chanting dark spells. He summons Flaw back to the Gemworld. Wrynn attempts to command Flaw, saying that he was the one who summoned him. Flaw says “No stripling, it was I who summoned you!” Wrynn has had horrible nightmares of Flaw for years. Flaw knows that Wrynn lusts for power. Wrynn’s wishes will be granted. White Opal kneels before Amethyst. Donal says that she’s a fairy tale story told to children. Flaw says that Wrynn must be reborn in the image of Chaos to counteract the new influence of Amethyst. This time, Chaos will win. Wrynn calls out as he’s transformed “Mother! Father! Forgive ARRRGH!” His new name is Mordru. This entry was posted in comics and tagged Amethyst Princess of Gemworld on 6/27/2009 by Anna.